In a wide array of social sciences, interest in emotion is flourishing. Psychologists, sociologists, anthropologists, communication scholars, and cognitive scientists are exploring human emotions in a variety of contexts. This book speaks to central issues raised by scholars in these disciplines through its review of leading cognitive appraisal theories of emotion, clarification of the nature of empathy, and exploration of how people identify and respond to the emotions hidden within the stories people tell. Intrigue with the separateness and oneness of human existence and experience is evident throughout history. It appears in the teachings of all great religions, in the commentaries of philosophers, and in the perceptions of the most famous characters in classic literature. Perhaps it is this wonderment with human distinction and unity that has spawned interest in empathy as a pervasive human phenomena. This book presents an initial examination of the role of cognitive appraisals in facilitating decoding accuracy and empathy. 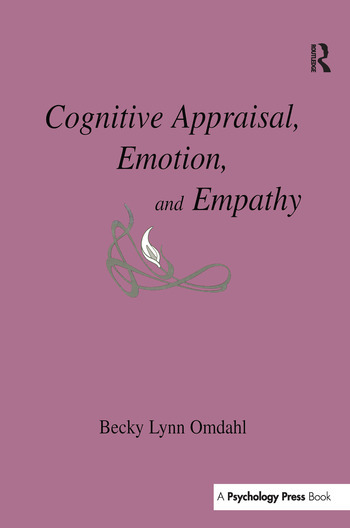 It compares the leading cognitive appraisal theories and addresses the relationships among appraisal information, empathy, and emotion decoding. Real-life descriptions of emotional experiences are used as the basis for a study examining the relationships between perceived appraisals and perspective-taking, and accurate decoding and empathy. Other studies probe the effects of specific appraisal information on decoding and emotional reactions, and address emotional reactivity to stories and delayed retention. Finally, specific applications are offered for parents, educators, social service employees, writers, advertisers, and people striving for personal well-being and healthy relationships. Contents: Part I:A Theoretical Overview: Cognitive Appraisal, Emotion, and Empathy. Introduction. Empathy. Cognitive Appraisal Theories of Emotions. The Relationship Between Appraisal and Empathy. Part II:Research Addressing Cognitive Appraisal, Emotion, and Empathy. The Generation of Real-Life Descriptions and Examination of Three Sets of Cognitive Appraisals. The Relationships Between Appraisals and Decoding Accuracy and Appraisals and Empathy. Responding to Scenarios. The Relationship Between Emotional Reactions and Memory. Part III:Summary, Theoretical Extensions, and Applications. Summary and Theoretical Discussion. Applications.